07/09/2010: "4th Street Bicycle Boulevard Ride"
As part of LACBC's endeavor to have LA's 4th Street remade as a bicycle boulevard, we are having a ride, walk, and press event to familiarize both "stakeholders" (ie, residents and businesses owners on or near the route, as well as cyclists from all over LA who would be using it in transit) and local news organizations about the project. Your Bicycle Fixation editor will be ride leader, and we'll have an easy, sociable roll through some of the prettier neighborhoods in LA, starting in Pan Pacific Park (near the Grove and the Farmers Market), passing through Hancock Park, St. Andrews Square, and Koreatown, to end up at Shatto Park just east of Vermont Ave. There will be refreshments! 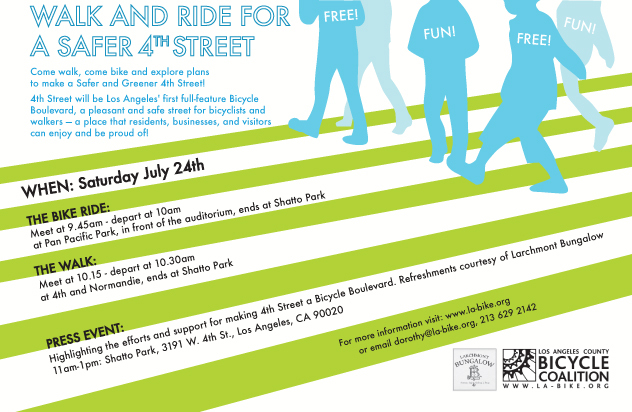 So come on over and represent for LA's first bicycle boulevard! You'll keep feeling the love for years to come, every time you ride down 4th Street!